When I was a kid, my family observed meatless Fridays, usually fish, potatoes, and a vegetable. I wasn’t crazy about fish back then. So imagine my delight when my mom decided to serve more casual fare for a period of time when my dad went to night school. Pancakes for dinner! And not just plain pancakes, pancakes with apples in them. She always served them sprinkled with cinnamon-sugar. Sometimes we kids would butter them, sprinkle on the cinnamon sugar, and roll them up and eat them with our hands. So our table manners became just as casual as our meal. My father’s training ended, and we continued to have apple pancake Fridays. What I didn’t realize at the time was that this meal was an economic decision, not an indulgence of the children. We had many apple pancake Fridays, enough so that I didn’t miss them when fish reappeared on Friday’s menu. Yesterday, when I made these for the first time in my life, they tasted just as wonderful as they did the first time. I’m using a “griddlecakes” recipe from the 1945 edition of The Boston Cooking-School Cookbook by Fannie Merritt Farmer that belonged to my mother. She loaned me this book just days before she died. I thought I would be returning it, but looking back to that day I think that she knew otherwise. 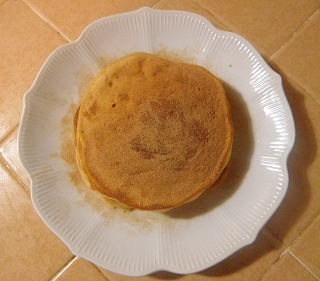 I’ve changed the recipe for basic pancakes just slightly, because nowadays baking powder is chemically different and quite a bit stronger, and the amount of milk says “3/4 cup or more,” and it seems like thinner batter cooks more easily. I also reduced the amount of melted butter, salt, and sugar from 3 tablespoons, ¾ teaspoons, and 3 tablespoons, respectively. If you prefer to use the original recipe, switch the quantities accordingly. You can substitute a bland oil like canola (like I did) for the melted butter if you prefer. I like using an electric frying pan for pancakes, like my mom did. It is almost impossible to burn them (as long as you don’t leave the room), and easy to hold the heat constant for even browning. Fannie recommends slicing the apple thinly. My mom used to make thin slices then cut them into about ½ inch squares. Mom used tart juicy apples, like Fannie recommends. Grannie Smith or Pippin apples would taste better than the Gala apples that I used. Fannie says to use one apple, but my mom seems to have used two or more, which I will also do next time. Soon. Make the cinnamon-sugar topping by mixing together the fine sugar and cinnamon. Peel and core the apple/s. Slice thinly and cut slices in half or thirds if large. Sift together dry ingredients: flour, baking powder, sugar, and salt. Beat egg until light. Beat milk into egg, then beat in (cooled) melted butter. Start heating griddle or electric frying pan (350 degrees). Mix together wet and dry ingredients, stirring vigorously. Do not overbeat, lumps do no harm. Batter should be thin enough to pour. 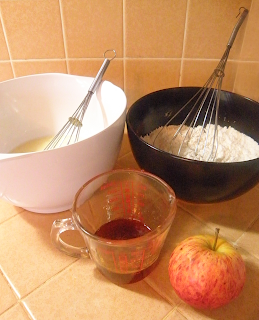 Quickly stir in apple slices. Add about 1 tbsp. canola oil to the pan, and distribute evenly—I mop it around with a paper towel. (Fannie recommends greasing with bacon, or rubbing with a cut turnip!) Drop or pour batter onto pan—I use a ¼ cup measure, which makes 4 cakes that fill my electric frying pan perfectly. Small bubbles will form in the pancake, followed by large bubbles. When you see large bubbles covering the surface, lift pancake with turner to see if under surface is browned. If so, flip over and brown on other side. Remove to platter. 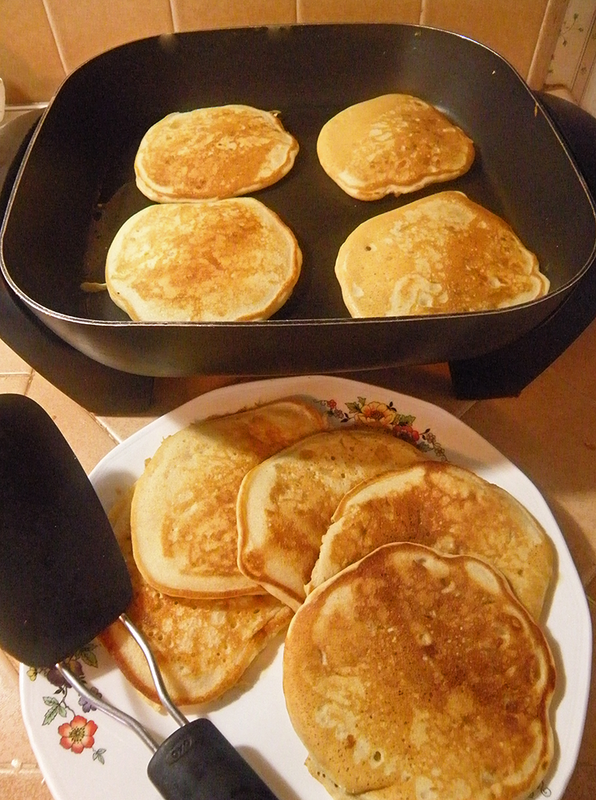 Continue to make batches of 4 pancakes (or whatever number fits in your pan). Add a little oil for each new batch. 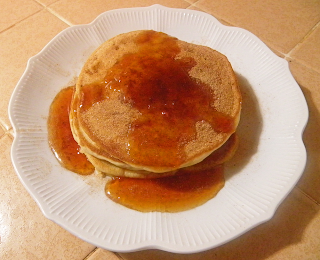 Serve pancakes with butter and cinnamon sugar. Or try them with apple syrup.